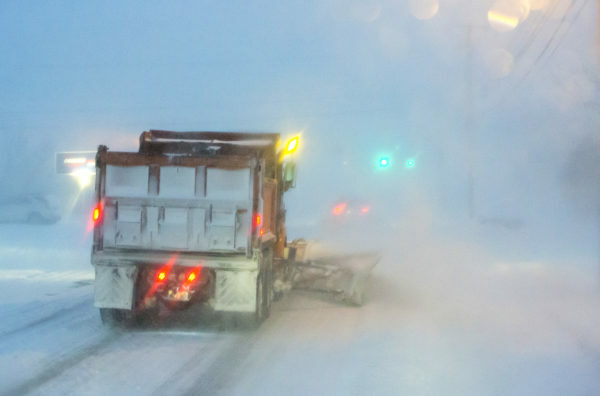 A Bangor Public Works plow moves snow in Bangor late Tuesday. 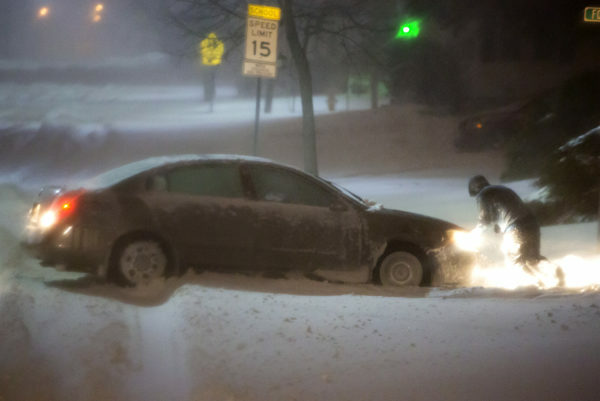 A person pushes their car out of a snow covered road in Bangor late Tuesday. 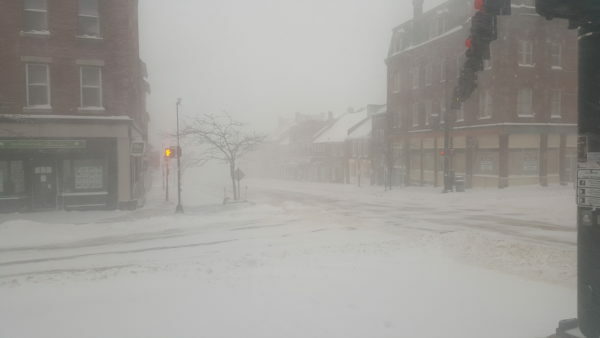 Downtown Belfast was largely abandoned Tuesday evening as a snowstorm dumped more than a foot of snow on parts of Maine. Many businesses and offices never opened, while others closed their doors early and sent workers home. Mainers across the state spent Wednesday digging out from a nor’easter that dumped as much as 22 inches of snow in some areas and left thousands without electricity. Bangor got 14.2 inches of snow, which is 2 inches less than the record for the day. However, Portland and Concord, New Hampshire, set new daily records for March 14, meteorologist Andy Pohl of the National Weather Service in Gray said just before noon. The strong storm knocked out power for thousands of residents that was not fully restored by Wednesday evening. Central Maine Power reported more than 40,000 customers lost power during the storm and Emera reported outages for nearly 8,000. By 5:30 p.m., Central Maine Power reported nearly 16,000 customers were still without power, while Emera’s total outages dropped to 557, mostly in the Down East area. Both companies expected power to be restored for most of their customers by the end of the evening. The storm shut down government offices on Tuesday and prompted late starts for schools on Wednesday. Lisbon Falls in Androscoggin County received the highest snow total during the storm with 22 inches, while towns in some areas along the coast saw less than a foot, including Pembroke, which received just 5 inches, according to Francis Kredensor of the National Weather Service in Caribou. Other areas in Washington and Hancock counties received higher snow totals, including Princeton and Ellsworth, which were both hit with a foot of snow, Kredensor said. The deeper snow fell in southern Maine, according to meteorologist Eric Sinsabaugh of the National Weather Service in Gray. Along the coast, snow switched to sleet or rain in some areas overnight, making for heavy early morning shoveling for some Mainers. High snow totals were reported in Androscoggin County, including 19 inches in Auburn, and in Pisquatiquis County, including 18 inches in Kingsbury Plantation, he said. Further north, 16 inches of snow was reported in Fort Kent, Kredensor said. The good news is that while folks in southern New England may be bracing for another snowstorm Saturday evening into Sunday, early forecasts show most of Maine may be in the clear, Kredensor said. Some areas along the coast could see some snow but Kredensor does not expect the storm to be too powerful. “It will be a lower-end system,” he said.